Florida Atlantic University (FAU) in Boca Raton sits in one of America’s most high-end recreational destinations, surrounded by many successful businesses and retired entrepreneurs. Over the years it has garnered a stellar reputation for business and innovation, and is now the 6th largest business school in the nation. Now FAU is combining these assets in its new Tech Runway for start-ups. Located at the Boca Raton Airport, young entrepreneurs are exposed to the daily launch of private executive jets, a constant reminder that success is possible as they launch they own businesses. 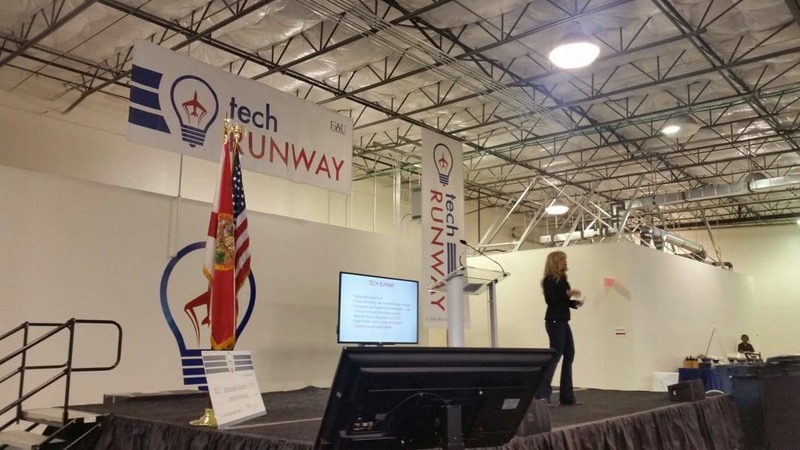 FAU’s Tech Runway is based on the MIT model that relies on heavy mentoring. Formal education, while extremely useful, cannot prepare you for all the unexpected challenges you face as an entrepreneur. Having a mentor who has been there before is an incredible advantage. The Tech Runway is a complete ecosystem supported by a business school, an innovation center, funding sources, and an engaged regional business community. The entire South Florida business community has a vested interest in seeing these new businesses succeed. Start-up candidates must navigate a series of important tests. Their business ideas, products and services are carefully scrutinized for potential feasibility. Winners are awarded a $25,000 grant and gain full access to all the University’s and Runway’s resources and mentoring program. We were honored and excited to be part of the inauguration. We’ve been asked to explain why entrepreneurship is so important to the future of our national economy. When it comes to thinking about the economy there are basically two schools of thought. One school thinks that wealth is limited. You have get your “share”. If someone else gets it first, there will be less for you. You have to take it from someone who has it. This “scarcity” consciousness is based on fear. As corporations get larger and have more to lose, legal departments gain more influence and innovation can get stifled. Large corporations tend to focus on competition and safety rather than innovation and risk. The other school of thought believes wealth can be created by innovation and thus is unlimited. Creating a new market where none existed, solving a problem that has not yet been addressed, or looking at the customers’ requirements in a whole new way are the hallmarks of the entrepreneur. Rather than fear, entrepreneurs are driven by belief in their concept and its marketability. Rather than focusing on the competition, they distinguish their products. Since the recession, entrepreneurs have not only created most of the new jobs, but also most of the new products and services. They have improved and extended our life spans, made our jobs easier, and raised our standard of living. Entrepreneurs are driven with burning desire to succeed no matter what. They take chances and bend the rules. No wonder the big guys buy so many of their fresh ideas from entrepreneurs! When you’re an entrepreneur, you usually start off undercapitalized with no safety net. No matter how good your business plan is, it’s the cash flow projection that guides your business. You must be resourceful to survive. Unlike the sluggish big corps, you can turn on a dime, quickly pivot away from losing propositions, seize fleeting opportunities, and learn by your mistakes. For successful ‘treps, information is not a currency, it’s a necessity. Job security is based on sales and customer loyalty, not status or how you look to the higher-ups. Entrepreneurs create new wealth. They share it with other businesses that supply them and sell their products. By improving our standard of living, reducing our costs, and providing us with new jobs, they are essential to the health and welfare of our economy. Here’s to the new entrepreneurs taking off from FAU’s Tech Runway at Boca Raton! Bravo!